Usually buried somewhere on the second page of a Hearing Notice (at least in Indiana and I presume in other states) is a notation that a nurse has the right to have an attorney represent them before the Nursing Board. However, for whatever reason, some nurses either fail to notice that part or don’t feel that they can afford an attorney and so, choose to go before the Board alone. They may believe that Board is made up of nurses who will understand their situation. Nurses are caregivers and usually are very honest and ethical. They may feel that if they tell the Board everything, then the Board surely will understand and take only limited action, if any at all, against the nurse’s license. There we have the first fatal mistake: nurses tend to overshare. While attorneys urge their clients to be honest before the Board, they can help the client present their case in the light most favorable to them and not share information that is not necessary. A nurse sitting alone before the Board may not know when to object to a question. A Board matter is a legal proceeding where the nurse, and any other witnesses, will be sworn in under oath. A court reporter will take down everything said during the proceeding. An attorney for the Nursing Board will advise the Board on legal issues such as when objections are made and advise the Board members how to rule. 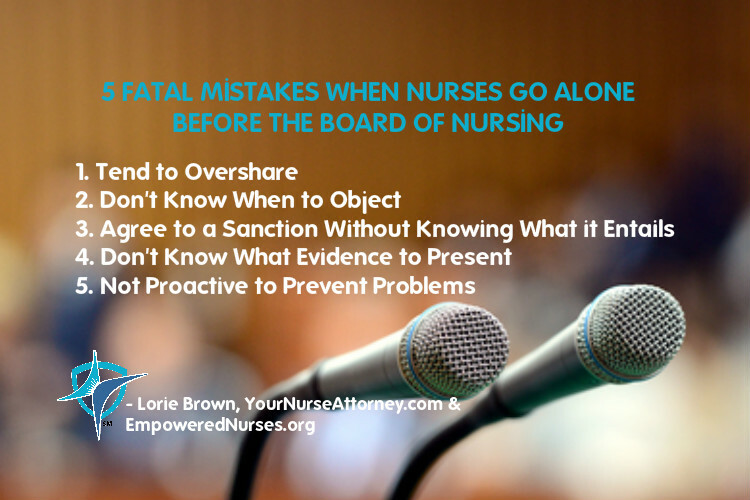 Going solo before the Board without the same level of legal knowledge as the Nursing Board’s attorney, that is, not knowing when to object to questions, can lead to harmful results. I’ve seen nurses who have been asked questions that were irrelevant to their situation. Yet, the nurses were honest and responded to the questions when they should have objected to the question. Sometimes providing such answers was not in the nurse’s best interest and caused the Board to extend or modify their probation with additional terms or even impose a harsher sanction. It is not unheard of that proffering too much information at a hearing could lead the Board to give greater sanctions to the nurse. Agreeing to something without knowing what it entails can lead anyone to trouble. With nurses, when Settlement Conferences are held, the attorney for the State, the Board member and the nurse will go into a room. If you are unrepresented, the State makes a recommendation and the Board Member either approves or gives their own recommendation. The nurse will be asked if they agree to the recommendation. This also happens at a Personal Appearance where the Board Member will ask the nurse if they agree to a particular sanction, such as probation. If the sanction is to place the nurse on probation, the Board and the attorney that is representing the State will not tell the nurse that in order to get off probation, the nurse will have to later go to a legal hearing in front of a court reporter, a Board member or possibly the full Board, the Board’s attorney and the State’s attorney, give an opening argument, cross examine witnesses and present their documentation and evidence to show that all the terms of probation have been met and that the situation which caused the nurse to go on probation is no longer present. Nurses going before the Board pro se, that is, representing themselves, will not know what evidence to present or what documents are necessary or helpful to substantiate their case. Usually the attorney for the State relies on evidence from employment and other types of records to make their case, whether they are criminal or peer assistance program records. Nurses need to know what evidence, such as witnesses and testimony that could help them as well as what documents are helpful and necessary in order to properly defend their case. In addition, if the nurse is trying to get off probation, it is the nurse who has the burden of proof, meaning that they must prove their case in order to get off probation. However, without having the proper documents and evidence, the decision may be negatively impacted. Not knowing what proactive things that a nurse can do to obtain a more favorable outcome can also hinder a favorable decision by the Board. Nurses need to set themselves up for success and be proactive so that they can introduce evidence and/or testimony, which will help them to get a more favorable outcome. First, don’t overshare. Just answer the questions and not go on a long explanation. Second, know when to object to questions. If something doesn’t feel right, ask the Board if you are required to answer it. Third, don’t agree to any sanction on your license without knowing all that it entails. Fourth, identify what evidence and documents are necessary and helpful to your case. Fifth, be proactive so that you position yourself to resolve your matter with the least possibility of sanctions.